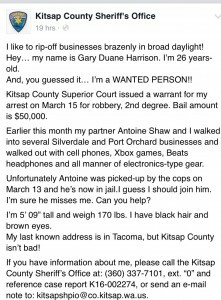 The Kitsap Sheriff’s Office’s efforts to engage with residents over social media are picking up, and yesterday it premiered a cheeky approach on Facebook to getting attention for wanted suspects. 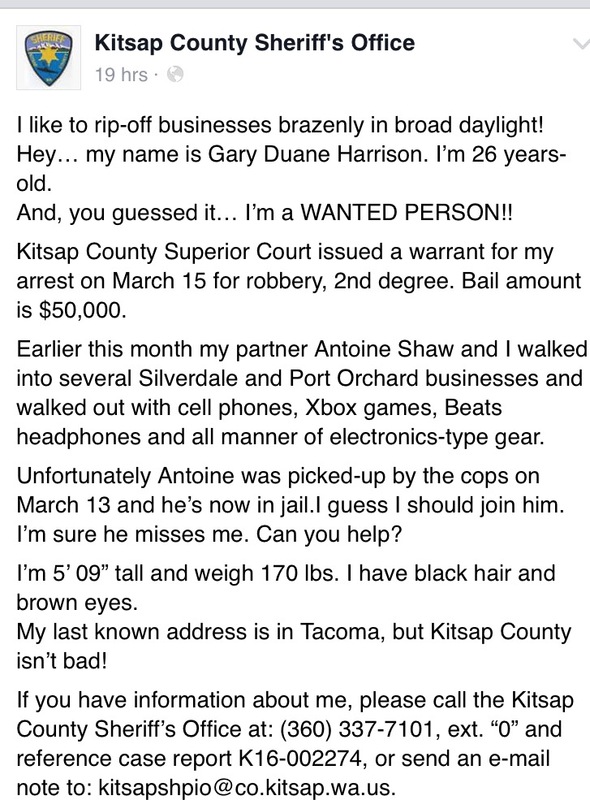 At this point tentatively dubbed “warrant Wednesday,” and loosely inspired by Bremerton Police Chief Steve Strachan’s weekly newsletter, the posts give a first-person account of some of the person’s crimes. Deputy Scott Wilson, the author of the posts and one of three of the office’s social media managers, said the posts have received incredible attention, with 51,000 views. “Whoa is right,” Wilson said, who acknowledged they are a departure from the office’s typically “vanilla” posts. It’s not something the office wants to do too much of, however, Wilson said. At some point, if overdone, the posts would lose their punch and would become Internet noise. They have also generated criticism, with a commenter on one post weighing in that it is belittling and unprofessional. Wilson, who serves as the office’s spokesman, acknowledged that feedback. Despite the speed at which information moves in the social media era, Wilson noted that as a post on one warrant suspect was being prepared, deputies were closing in and took the suspect into custody. The office plans to use its Facebook page for education, everyday community outreach and highlighting personnel changes and milestones. Its Twitter feed, Wilson said, will be used for public safety updates and immediate issues the office wants to communicate to the public.